Welcome to&nbsp;Gotham City, America's crime capital! There is a new force for the cause of justice - District Attorney&nbsp;Harvey Dent. And, a mysterious creature of the night,&nbsp;The Batman! Who is this&nbsp;Dark Knight? How is he connected to the dashing millionaire philanthropist&nbsp;Bruce Wayne? Everyone from the&nbsp;Gotham Police&nbsp;to&nbsp;Commissioner Gordonto reporter&nbsp;Alexander Knox&nbsp;and photographer&nbsp;Vicki Vale&nbsp;want to know. 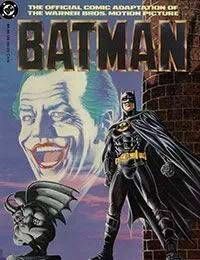 This adaptation of the&nbsp;Tim Burton-directed&nbsp;Batman,&nbsp;brings&nbsp;Michael Keaton's&nbsp;Batmanface-to-face, or mano y mano with&nbsp;Jack Nicholson's&nbsp;Joker! What scheme does the "Clown Prince of Crime" have up his sleeve to celebrate Gotham's bicentennial?